We rode TVS’ hotly anticipated 125cc scooter, the NTorq, at their test track in Hosur, and here are our first impressions. In a country where scooters are considered mere tools for commuting, getting from point A to point B, it’s difficult to imagine them bringing a sense of excitement. But that notion was disproved by the likes of the Italians, with the Aprilia SR150, which showed that sporty scooters can work in India, at least to a certain extent. But while it might be easier to go down a niche path of making a scooter outright sporty, it’s a lot trickier to do a blend of excitement and practicality. But TVS might just have nailed that formula with the NTorq 125. The NTorq was a long time coming. TVS had showcased the Graphite concept back at Auto Expo 2016, and one can clearly see the design influences from the concept bike to the production model. While some of the more extreme design touches of the Graphite concept, such as the single, offset projector headlamp, the oddly shaped digital instrument cluster, and the completely exposed gas-charged rear monoshock haven’t made it into production, but the overall sharp lines and angles have. TVS says that this design has been inspired from stealth fighters, and okay, we’ll give them that. Though to really carry this stealth fighter motif, a matte dark gray paint scheme would’ve been perfect. That said, the current four paint schemes - matte yellow, matte green, matte red and matte white - do look sporty. TVS has certainly played it safe with the front-end design of the NTorq, which feels like a derivative. Its halogen headlamp looks like it was inspired from that of the Honda Dio. There’s no LED headlight on offer though, but it does feature an LED DRL, which TVS says has a “bat-wing” design… yeah right… looks more like the bowtie logo of a certain American car maker. The front indicators are integrated into the handlebar cowl, and if I’m being honest, they look a bit insipid. But safe isn’t a word that you would use to describe the rear-end design. TVS had been teasing everyone with that taillight design for a little while before the NTorq’s launch, and it does look pretty sweet in the flesh. The jet exhaust like faux vents at the back might feel like overkill to some, but we certainly do like them. That said, the more subtle vents on the Graphite concept along with its more 3D-style tail light might’ve hit the spot better. We like the rear indicators though. They’re mounted on small stalks (like on a motorcycle), but flow into the shape of the rear. But the NTorq boasts something that we’ve rarely seen on Indian scooters, and that is a ridiculous attention to detail. The carbon fibre style trim on the seat with red stitching, machined footpegs and filler cap, the carbon texture around the switches - it all looks properly upmarket. The switchgear quality too is top-notch, and the switches themselves are large for easy access and feel quite tactile as well. And it also gets an engine kill switch - something we’ve never seen on any scooter in India. There has been a lot of hype regarding the NTorq’s fully-digital SmartXonnect instrument cluster, that allows riders to pair their phones to it using Bluetooth. But it does live up to all that hype. It comes with a smartphone app, only on Android so far, that once paired, can show you where you parked your scooter, and also also generate a report for your last ride, showing you distance covered and top speed achieved. Using the app’s built-in navigation (with maps from MapMyIndia), you can search for a destination to begin route guidance. The navigation assist will then display directions on the console. There are personalisation features as well, which let you customise your rider name, which will then be flashed on the screen the next time you start the scooter. And there’s a “do not disturb” mode, which can then use the “auto reply SMS” feature to send a message to anyone who calls you when you’re riding. You can even set an overspeeding alert, which will display a warning once you cross your set speed limit. The instrument cluster itself can also record top speed, and has a lap timer as well. A bit too much? Well, I think most youngsters will beg to differ! For the NTorq, TVS developed an all-new engine from the ground up, and this is one of the most powerful motors in the 125cc scooter segment. It makes 9.4PS at 7,500rpm - one the highest in this class of scooter. This 124.79cc single-cylinder air-cooled motor gets a 3-valve head that allows it to rev a bit higher than other scooters, but manages a similar torque figure to its rivals - 10.5Nm coming in at 5,500rpm. With one extra PS of power as compared to its immediate competition, you would think that the NTorq would feel really quick. But while it feels reasonably so, it’s acceleration won’t really blow your mind. That said, TVS does claim a quickest-in-class zero to 60kmph time of 9 seconds. But we’d have to properly test the NTorq to verify that claim. Acceleration to 30kmph from a standstill feels quite brisk. There’s a strong mid-range too, but progress from about 60kmph, though, tapers off. The NTorq remains fairly stress free up to 80kmph, something scooter speed junkies are sure to appreciate. Beyond that, like most scooters in this space, it feels a bit out of breath. However, on the long straight at the TVS test track, we did manage to see 96kmph on the speedo, so the company’s claim of a top speed of 95kmph is quite believable. With a kerb weight of 116.1kg, it is the heaviest scooter in its class. So, that weight also affects how quick the NTorq feels when you open the gas. Also the variomatic feels like it has been tuned for more everyday use and economy as compared to outright performance. That said, the motor is extremely refined, with almost no vibes at any speed. There is a fairly audible induction noise, which along with its raughty exhaust note, eggs you to open the throttle hard. The NTorq is built around an all-new underbone chassis, and sports telescopic suspension at the front, with a gas-charged monoshock at the back. The front suspension is definitely set up a bit on the firmer side, and that definitely helps the NTorq turn in pretty quickly, even with a small input at the handlebars. This quick steering does take a bit of getting used to, almost like the earlier Apaches. But at the same time, its longish wheelbase of 1285mm, makes it feel planted through the corners. And a lot of the NTorq’s handling prowess is down to specially developed TVS Remora tyres, which have a very rounded profile and are the widest in this segment of scooters - 100x80x12 at the front, and 110x80x12 at the back. These tyres do allow for surprisingly high lean angles, but we could’ve really done with stickier rubber. Here, it feels like the compromise is towards life rather than outright grip. Even then, some of the journalist junta testing the NTorq around the long sweeping corners at the TVS track managed to scrape the underfloor body panels. This compromise towards practicality can also be felt when it comes to the rear suspension. It feels a bit soft when leaned over, causing the scooter to wallow a bit through fast corners. But the high-frequency damping is absolutely on point. Over the Belgian pave test track at the TVS facility, the suspension totally ironed out all the bumps, provided you tackled them at a bit of speed. Going slower though, the horrifyingly bumpy surface of the Belgian pave could be felt. In the braking department, the NTorq comes equipped with a 220mm petal disc brake at the front and a 130mm drum at the back. The bite from the front disc isn’t overly sharp, but it provides good feel and progressive deceleration. The rear though is surprisingly sharp in bite. Use any one, or both the brakes in tandem, and the NTorq pulls to a stop without any drama, at least on the dry, smooth tramac of the test track. 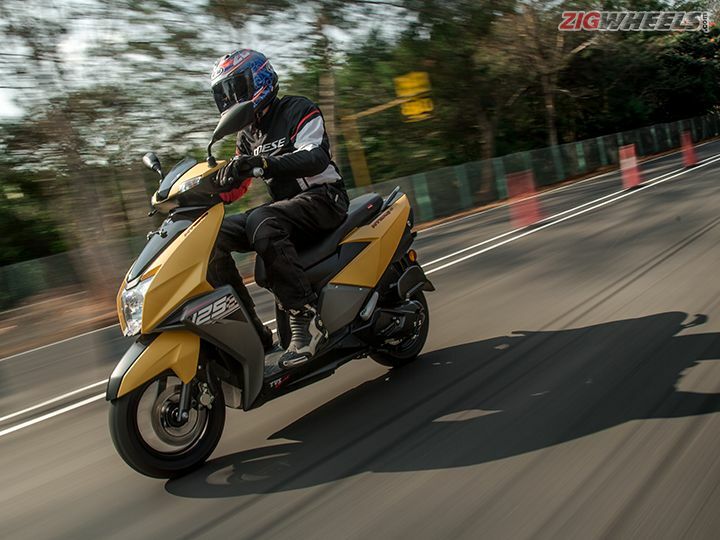 TVS isn’t offering ABS or its Sync braking system on this scooter at the moment, but we’re told that the latter will be offered in the near future. But the NTorq plays in a scooter segment where practical matters… er… matter. So while its intentions might be sporty, it really can’t afford to miss out on these aspects. And here’s where we have a few gripes. The floorboard, for example, has adequate space for someone with big feet, but won’t hold much more than a small laptop bag. Forget about carrying groceries for the whole family or an LPG cylinder. But that might be forgivable, considering the fact that the NTorq is aimed towards youngsters - Gen Z as TVS likes to say. And though there are a couple of luggage hooks, they will certainly mind the lack of cubby holes on the front to carry mobile phones and other knick-knacks. The NTorq’s 22 litres of underseat storage is highest in its class - a whole one litre more than the Suzuki Access. That said, it still won’t accomodate most international-spec full face helmets, but should be more than enough for most other things. And it does get a USB charging port and a little boot light. But what the NTorq gains in underseat storage, it loses in fuel tank capacity - just 5.0 litres - the least in its class. And that really emphasises that the NTorq is still urban at heart. That said, TVS has absolutely nailed the ergonomics of the NTorq. The seat is soft, but not overly so, and that allowed us to spend over an hour in the saddle without any aches or pains. The handlebar height is spot on too, so even taller riders won’t have the bar ends hit their knees while taking U-turns. When it comes to making a scooter that blends practicality and excitement, TVS has checked all the right boxes with the NTorq. Though, overall, as a package, it still veers more towards practicality. But you know one box it checks better than the rest is value. At Rs Rs 58,750 (ex-showroom Delhi), it almost matches its competition from Suzuki and undercuts its Honda rival by a fair margin. And at the same time, it offers a great riding experience, a fair bit of performance, and a whole raft of features which are not only funky, but extremely useful as well. And that, in our books makes for a great scooter.